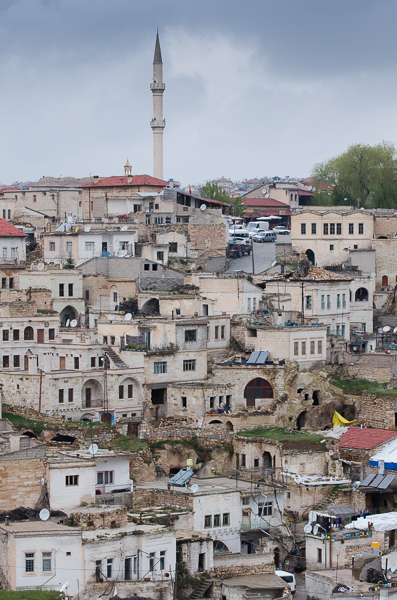 Eastern Anatolia, a tourist's "must-do," akin to U.S.'s Grand Canyon, albeit with more centuries of recorded human habitation. Though I was told told that region is traditionally more socially and religiously conservative than Istanbul or the Aegean coasts, my guide (who was also my hotel owner) happened to be a wine enthusiast, in fact an Italian-trained sommelier. Fairy Chimneys, akin to structures I saw in southern Alberta, CA called whoo hoos? Fairy Chimneys are created from erosion--rain, wind, rivers. People, then Christian monks lived in these structures to escape myriad of of crowds from Silk Road and other marauding folks. Another way to hide from marauders was to dig underground. Kaymakli Underground City. Imagine how dark it was down there with no lights but oil lamps. This a stone that blocked a doorway, with hole in middle to provide view of who was 'a knocking. That's me 'a knocking. And I am crouching. I am a relatively short woman, which gives you perspective of space. I was told that it is believed that the Gods will take from you anyone/anything you give too much attention/love. Thus these "evil eyes" (everywhere in Turkey -- even in the roads-- are meant to take your gaze away from your loves so the Gods don't take away that which you love or admire. This is a wishing tree. One of the skilled craftsmanship of the area--pottery and ceramics. Would have enjoyed buying a piece or two, but too expensive at the time. 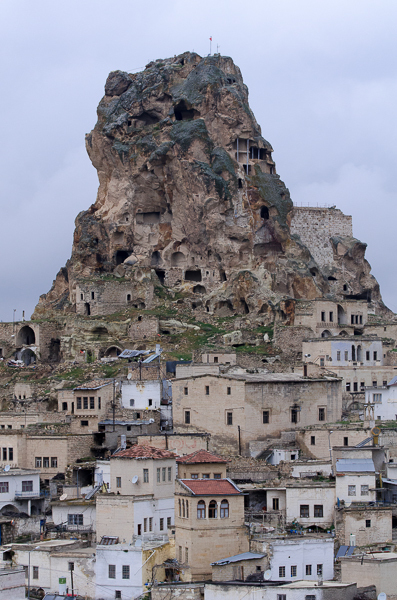 Uchisar Castle--a natural formation that was made into a fort and residence to stave off marauders. Great view from the top. For many, the highlight of their visit to Cappadocia is a hot air balloon ride. My day was foggy, almost dangerously foggy to fly. Stage 1 of breakfast spread at Sira Cave Hotel. Second stage is eggs. DELICIOUS! Clotted cream with honey and loads of different types of bread to dip.